Anhinga is a beach club, restaurant and bar on the sandy bay of Civit Koyu (Indigo Bay), part of the Kaplankaya resort on the Turkish coast. With a number of notable architects already contributing to the architectural identity of the resort, we felt strongly from the outset that our designs should provide a complimentary contrast to the other proposals. Though extensive, the site is held together by an esplanade, the main circulatory route that brings the beauty of the landscape into direct contact with the guest as they make their way from zone to zone and building to building. Working in collaboration with the project masterplanners, WATG, we used this concept of walking through the landscape to bring our proposals for the creation of a beach-based leisure zone into contact with the residential, wellness and other culinary attractions of the resort, without putting a building on the beach. Anhinga is an inhabited landscape, rooted in and respectful of its location whilst taking inspiration from other cultures and providing a more playful and social alter-ego to the contemplative quiet of the nearby wellness spa. To design this inhabited landscape, we began with research into traditional Aegean techniques, geometries and massing, looking for ways to insert enclosed space into topographical forms. Terracing traditionally transformed steep terrain into agricultural opportunity, and has become an instantly recognizable characteristic of the region. 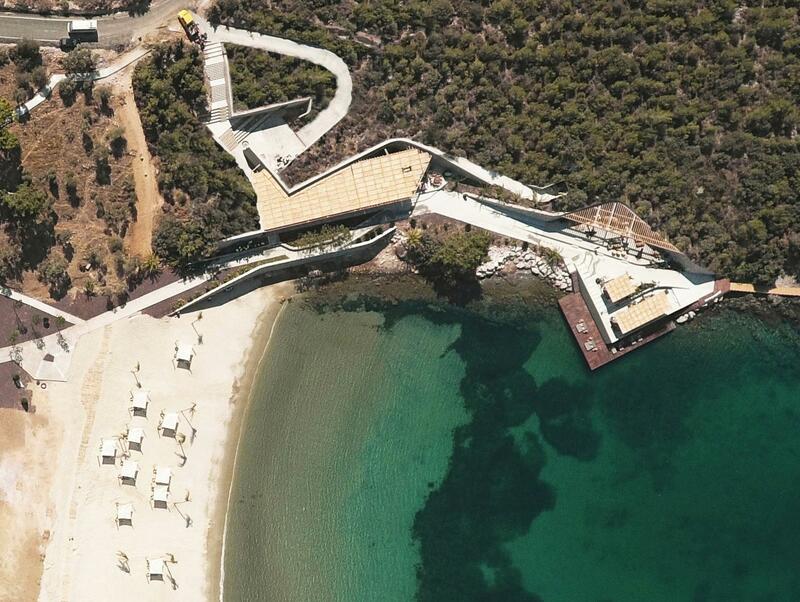 For us the stone retaining walls became an opportunity for habitation and the flattened land they retained became the gently sloping, comfortably wide pathways that were key for inter-connecting the beach, restaurant, bar and facilities effortlessly. The pathways carve out the negative space of the restaurant and bar, which themselves are positioned and oriented according to the average axis of the sun during high summer, fully exploiting the view of the sunset. A simple pergola is all that is required to create the condition in between full external exposure and full internal shelter that makes the intense Turkish summer comfortable and even luxurious. 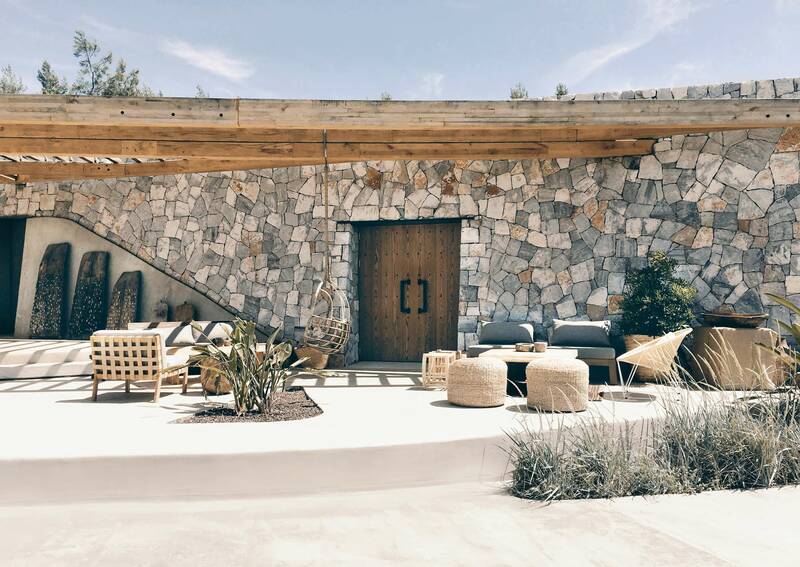 Sitting neatly on the stone walls of Anhinga’s dining and lounging areas, the suspended natural reed canopy allows air to circulate and the space beneath it to stay cool. Throughout the day dappled sunlight filters through the reeds, lighting and shading the space simultaneously. At night down lighting continues to animate the canopy from within, creating a warm, intimate atmosphere for evening dining. 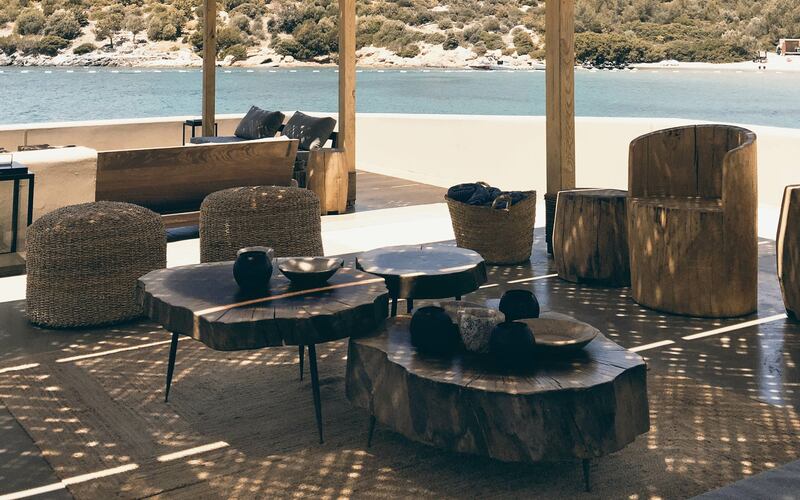 On the beach fabric ‘pergolas’ are hung from the randomized grid of timber columns and they create a varied topography of shading conditions for guests to explore. Furniture and decoration are an eclectic balance of local and further-travelled design and bespoke elements, in keeping with the concept of the project. Similarly the naturally aromatic, hot green landscape has been injected here and there with more tropical species selected to act as exclamation marks within the indigenous growth, signposting the new energy and activity taking place.